One of Mass Effect’s most notable themes is the journey and change that everyone undergoes throughout the duration of the series. 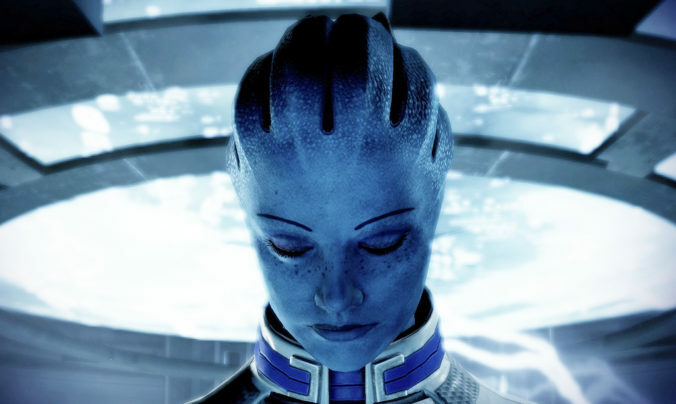 Liara T’Soni is a prime example of someone that experiences great personal change over the course of the three games. When we first meet Liara on Therum, she is a young and curious scientist engrossed in the mysteries of the Protheans, an ancient and highly intelligent race that once inhabited the galaxy. Though her previous expeditions had been primarily uneventful, her trip to Therum lands her in a rather precarious standoff between herself and several of Saren’s troops. After barricading herself behind an energy field within the underground structures on the planet, Liara accidentally traps herself in a second field. Help, however, is not far away, as the arrival of Commander Shepard yields relief for Liara from both the Prothean technology and Saren’s ruthless troops. Liara is quickly drawn into the odyssey of the Reapers when she learns that Shepard came into contact with a Prothean beacon. Liara’s initial meld with Shepard in an attempt to decipher the bizarre images from the beacon shifts her focus to the conflict with Saren, and on a larger scale, the impending war with the Reapers. Shepard serves as the catalyst for this new step in Liara’s journey, providing her with a rich reserve of new data that she cannot ignore. By connecting with the beacon, Shepard unknowingly became a port to one of the greatest sources of Prothean knowledge that Liara has ever had access to. Liara’s formidable intelligence is clear early on, though she is also presented as a socially naïve damsel that requires rescuing by others. Despite her shortcomings and lack of familiarity with Shepard and their crew, Liara displays compassion towards them throughout their mission to stop Saren. Even after the death of her mother Matriarch Benezia, Liara continues to help Shepard and does not allow her personal loss to derail the mission. Months after Saren’s defeat and shortly after the destruction of the Normandy, Liara embarks on her own personal quest for information regarding Commander Shepard. Inspired by her loyalty to Shepard and deep concern for her friend, she relentlessly pursues leads on the whereabouts of Shepard’s body. This ultimately leads her to the mysterious Shadow Broker, a clandestine information broker that makes a business out of the galaxy’s most dangerous secrets. In the process of retrieving Shepard’s body, Liara is forced to leave behind another friend in order to escape, but she vows to return and save him from the grips of the Broker. As the result of a deal with Cerberus, Liara is unable to see or to speak to Shepard for two years while the Commander is rebuilt. During those two years, her hatred of the Shadow Broker sprouts a vein of ruthlessness in her. Though she comes across as hardened, it makes her particularly effective as an information broker on the planet Illium. Her position there allows her to gain leads on both the Shadow Broker, which fuel her plans to eventually enact revenge. Another of Liara’s greatest developments occurs in her pursuit of the Shadow Broker. After an attempted assassination attempt, she hunts down the Spectre Tela Vasir, who was secretly working for the Shadow Broker. Liara does not back down from the Spectre, instead she tracks them down and takes Vasir out, ending any threat that the Spectre posed to her. Liara no longer shies away from threats to her person or to her goals, instead she tackles them head on and resolves them with deadly force, if necessary. At the climax of her long feud with the Shadow Broker, Liara and Shepard take him down and rescue her friend Feron. In the aftermath, Liara makes the decision to take up the role of the new Shadow Broker, both at a personal sacrifice and effort to aid Shepard in their conflict with the Collectors and Reapers. The decision is not only a reflection of Liara’s change and growth as an individual, but also her devotion to Shepard. At the start of the Reaper War, Liara is stationed on Mars to work on the Prothean archives. When Shepard and the Normandy arrive, the base is overrun with Cerberus troops that are seeking information about an ancient Prothean weapon. They try to capture Liara, but she takes out the troopers pursuing her as Shepard looks on. This time, Liara did not need Shepard to save her; she saved herself. We also learn that Liara made a bold move to protect her assets as the Shadow Broker from the hands of Cerberus. When the Illusive Man went looking for the Shadow Broker’s ship in the Hagalaz system, Liara destroyed it to prevent Cerberus from acquiring it and its resources. She doesn’t allow the Illusive Man the opportunity to gain access to her knowledge and connections, and without hesitation she cuts off his only route to the Shadow Broker’s network. During the war, Liara witnesses the overwhelming capture of her home planet Thessia by Reaper forces. In her grief, Shepard reminds her that she can still help and make a difference to the remaining asari in the galaxy. Liara immediately begins efforts to help the refugees that have escaped the planet. She is also a major contributor in the construction of the Crucible, an ancient weapon designed for destroying the Reapers. In uncovering the blueprints and offering resources to the Alliance for its construction, Liara aids the galaxy in building a potential resolution to the threat of the Reapers. Over the course of the Mass Effect trilogy, Liara transforms into a determined and ruthless individual with a great drive to help not only her friends, but also the galaxy. She learns to not only save herself from present threats, but also to enable safeguards to protect herself from future dangers. In situations where a tough call must be made, she doesn’t shy away from the difficult choices that must be made. Liara is no longer a quiet scientist that reserves herself to solitary dig sites; she is a major player in the galaxy that aids in shifting the course of events, and aiding Commander Shepard in their quest to stop the Reapers.